The Proceedings of the IEEE released a new special issue focused on the future of phased array technology. The issue describes emerging core technologies and potential new applications of phased arrays covering a diverse range of disciplines. 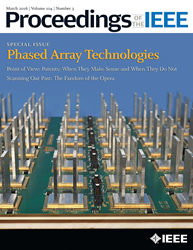 This special issue provides the reader a look into the future of phased arrays. As phase array technologies continue to grow, new technologies are beginning to have a positive impact for 5G communications. Proceedings of the IEEE, the most highly cited general-interest journal in electronics, electrical and computer engineering, and computer science, has released a special issue focused on the future of Phased Array Technologies. Modern phased array technology spans a range of diverse disciplines in electrical engineering, from RF microwave engineering to digital and mixed signal VLSI design, device physics, high-speed data networking and many more. The special issue features 13 papers that look into the future of phased arrays by broadly describing emerging core technologies as well as potential new applications covering a diverse range of disciplines. “Digital Phased Arrays: Challenges and Opportunities” by C. Fulton et al. The paper overviews the many interrelated aspects of the digital beamforming trade space, covering data distribution within the array, data processing, calibration, and fixed versus adaptive beamforming. “The Evolution to Modern Phased Array Architectures,” by J. S. Herd and M. D. Conway. The paper discusses how phased array costs can be minimized by utilizing high-volume commercial microwave manufacturing and packaging techniques, coupled with digital array architectures. “A New Era in Elemental Digital Beamforming for Spaceborne Communications Phased Arrays,” by P. K. Bailleul discusses the use of digital phased arrays in addressing the challenges faced for space applications, especially in the context of size, weight, and power consumption. “On the Design of Phased Arrays for Medical Applications,” by O. M. Bucci et al. The paper covers microwave medical imaging and the therapeutic delivery of nonionizing radiation to targeted cancerous sites in patient. “Multifunction Phased Array Radar for Aircraft and Weather Surveillance,” by J. E. Stailey and K. D. Hondl. The paper explores the Multifunction Phased Array Radar (MPAR) multiagency initiative to investigate the feasibility of replacing aircraft surveillance and weather radar fleets in the United States with a network of phased array radars based on a single, scalable networked array architecture. “Adaptive-Weather-Surveillance and Multifunction Capabilities of the National Weather Radar Testbed Phased Array Radar.” by S. M. Torres et al. The paper covers the National Weather Radar Testbed (NWRT), which is a phased array radar established to evaluate the potential of phased array technology in predicting weather while performing air traffic surveillance from a common platform. To learn more about the new revolution for phased arrays, please visit the Proceedings of the IEEE’s website, LinkedIn or Facebook page.